Last weekend, Trevor had people over for Pizzafest 2010–basically, a bunch of people went out during halftime of the Rams game, picked up pizzas from different restaurants, and brought them back to Trev’s place to try. It was a lot of fun, so I decided to host a similar function this week, but with buffalo wings. Most people bought wings from local restaurants, which I’ll rank below, but one guy made wings at home. They were fall-off-the-bone good. Culpepper’s: These were classic wings, crispy on the outside, moist on the inside, with just the right amount and flavor of sauce. I’ve had these before and wasn’t all that impressed, but today they were so good that I wanted to cover myself in chicken skin and dip myself in Culpepper sauce (yes, I’m aware that doesn’t make any sense). Ozzie’s: Almost identical to Culpepper’s, but they had slightly less sauce. Buffalo Wild Wings: I know, it’s a chain, but their wings are darn good. They’re just meat and flavor, nothing else getting in the way of the good stuff. Syberg’s: With their mustard-based sauce, these had the most unique flavor of the bunch. St. Louis Pizza and Wings: These wings were decent, but they were doused in a really watery sauce. Wing Stop: Very similar to St. Louis Pizza and Wings. As several of us commented, these tasted really unhealthy. 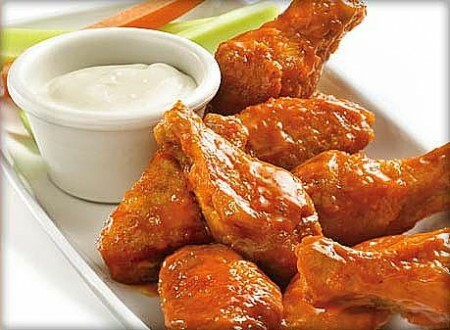 Hooters: Honestly, these didn’t even seem like wings. They were fried chicken, heavily breaded and greasy. They weren’t bad, but they don’t fit into the category of wings. After the event, some other friends suggested we try the wings at Weber’s, Mangia, and Pi Pizza. What do you think? What are your favorite wings in St. Louis. Or if you don’t live in St. Louis, what do you think makes the perfect buffalo wing? This entry was posted on Sunday, November 21st, 2010 at 11:43 pm	and is filed under food, restaurants, St. Louis and tagged with St. Louis. You can follow any responses to this entry through the RSS 2.0 feed. I used to goto a place right around the corner from your apt for wings every Wednesday… before it closed. I forget the name, it was near the Congress/Senate building. Lousy restaurant, but great wings. I’d say Culpeppers are the best, but BWW can’t compete with the selection if you want variety. What made their wings so good? Were they a similar style to Culpeppers? How can I think turkey with wings on the mind? Must go get some. I hate to say it, but we ordered Pizza Hut wings once, and they were the most intolerably hot wings on the planet. No one could down them. I wonder if this makes me less of a man. Now, I prefer boneless wings, an I KNOW that makes me less of a man. It’s okay, Trevor prefers boneless wings as well. I have nothing against them–in fact, chicken tenders were my favorite restaurant food as a kid–but I don’t think they count as wings. They’re still chicken tenders.